Ask your horse to say ahhhh! Like people, horses have a variety of problems with their teeth. Some are inherent or genetic, and others result from the general wearing down of the horse's teeth, accidents, or disease. 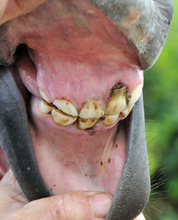 Absent Teeth: Missing teeth are fairly common in horses. They are usually caused by failure of normal development of a tooth bud. If the missing tooth doesn't create a problem with chewing, no treatment is necessary. Canine Teeth: Canine teeth are large and tusk-like in form. 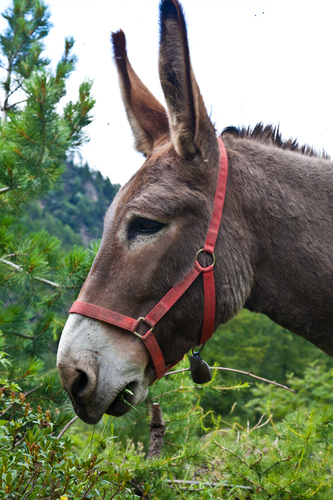 They are commonly found in male horses and may need to be rasped down to prevent interference with the bridle or bit. A canine tooth that fails to erupt may cause a cyst in the gum which should be evaluated by an equine dentist or veterinarian if it causes sensitivity in the gum. Dental Caps: Dental caps are deciduous or temporary teeth that remain attached to the permanent teeth after they have erupted. The caps can be extremely sharp and may cut the cheek or tongue and interfere with eating. Dental caps should be removed once the adult teeth have emerged from the gum line. Hooks: Long sharp points may develop on the first upper cheek teeth known as the second premolars and the last lower cheek teeth, the third molars. This can cause a malocclusion problem and the long sharp points may lacerate the gums and make eating painful. Small hooks can be filed off, and large hooks should be cut off. Impacted Teeth: When a horse has a foreshortened upper or lower jaw, insufficient room exists for the teeth to erupt normally. When the teeth cannot come through, they become impacted. If the impacted teeth become infected or create chewing problems, they should be extracted. Retained Incisors: Retained incisors are similar to dental caps except that the retained incisors are in front of the permanent incisors. These incisors should be extracted to insure a correct bite. Split or Broken Teeth: A fractured or cracked tooth may not cause any problems especially if the split doesn't extend below the gum line. If damage to the broken or split tooth involves the root or surrounding bone, the tooth should be removed. The main problem with a split or broken tooth is that the opposing tooth will not be ground down during the eating process resulting in increased length that may interfere with chewing. In this case, the opposing tooth should be floated or rasped frequently to prevent mouth injury. Supernumerary Teeth: Supernumerary teeth are excess teeth that develop due to the splitting of a tooth bud. These excess teeth create dental crowding that push other teeth out of alignment and may cause gum infection and tooth decay. If the extra teeth injure the gums or cheek, they can be filed or trimmed. In some cases, supernumerary teeth should be removed to keep the regular teeth properly aligned. Wolf Teeth: Wolf teeth, often present in the upper jaw, are vestiges of the first premolars. Delay in eruption and displacement by the second premolars may cause abnormal alignment. If sharp points develop they may lacerate the cheeks and tongue. When this occurs, wolf teeth should be extracted. Wolf teeth can also interfere with the bit, and when this occurs, they should be extracted at 18 to 24 months of age. Like people, horses are likely to suffer dental problems from time to time. Catch the problem early reduces pain and suffering, and saves money. Abnormal chewing patterns, along with susceptible teeth that may be softer than other teeth, often result in wear problems that tend to be progressive and become worse with time. Not only do these wear patterns interfere with eating, but they also affect the performance of the horse because of interfering with the bit, causing weight loss and making digestion of feed more difficult. Smooth Mouth: When both the enamel and dentin wear down at the same time, the rough grinding surface of the cheek teeth becomes smooth and the horse cannot grind its feed properly as it chews. Weight loss, digestive ailments such as colic, constipation and malabsorption occur. If the smooth surfaces are the result of improper floating, they may self-correct over a period of time. In other cases, there is no effective treatment and the horse's diet will need to be changed to soft mashes, chopped wet hay, or processed grain. Step Mouth: Changes in the height of adjacent premolars and molars result in this disorder. A lost tooth or a retained dental cap may cause step mouth which is a serious problem because of the difficult the affected horse has in chewing and digesting food. Treatment involves cutting elongated molars and rasping the teeth at regular intervals to prevent the step effect. Wave Mouth: Wave mouth usually occurs in older horses and ponies. The crests and troughs created by the wave pattern allow some teeth to become too long and others opposing them, may be ground down to the gum line causing tooth and gum injuries. Mild cases can be corrected by floating the teeth at frequent intervals. In severe cases, rasping, chiseling, and cutting the molars may be necessary to allow the horse to chew properly. Another problem that often affects horse's mouths and teeth is periodontal disease that occurs when the gums become infected and separate from the teeth. Most commonly, this occurs in the upper cheek teeth, but can occur anywhere in the horse's mouth. 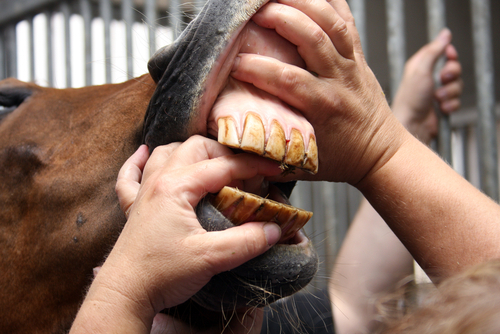 A routine exam of the horse's teeth can catch peridontal disease before it leads to painful tooth loss. Horses do not develop cavities in their teeth. Instead, dental infection begins at the root of the tooth and is usually preceded by gum infection. When the gums are infected, small pockets and crevices along the edges of the gums trap food, the pockets and crevices then become infected. The infection works its way into the pulp cavity leading to root abscesses and bone infection. When the bone recedes because of the infection, the roots become exposed and the stability of the tooth is lost often leading to the loss of the tooth. Often the cheek teeth in the upper jaw become infected. The roots of these teeth are imbedded in the maxillary sinuses. When the roots of these teeth are infected, they cause bacterial sinusitis and a purulent, foul-smelling discharge through the nostril occurs. A fistula or abnormal passage may develop between the oral and nasal cavities, making it necessary to extract the tooth to cure the infection. 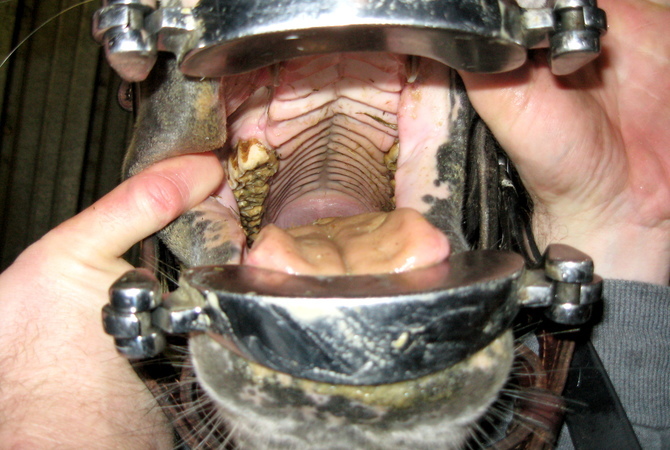 Equines with a congenital mouth deformity require additional and more frequent dental care to avoid problems. Some horses are born with a congenital malocclusion between the upper and lower jaws causing incorrect bite problems. These malocclusions may lead to mouth infections, poor chewing patterns and impaired digestion that may compromise growth and development. Veterinarians often recommend that horses with malocclusions not be used for breeding because most malocclusions have an hereditary basis. Parrot Mouth: With this deformity, the lower jaw is shorter than the upper jaw, causing the upper incisors to overhang the lower incisors. The upper incisors become elongated and grow like rabbit teeth. If detected at an early age the problem can be treated by applying wire tension bands to the upper jaw, thereby slowing its rate of growth. Sow Mouth: Sow mouth is the opposite of parrot mouth with the lower incisors projecting beyond the uppers much like those in a bull dog. This condition is less common than parrot mouth. Shear Mouth: Shear mouth is related to a widening of the upper arcade of teeth making it much wider than the lower arcade. This produces uneven wear on the teeth with extremely sharp shearing edges developing on the cheek teeth. 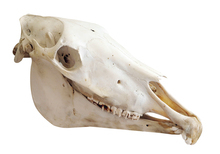 Older horses often develop this problem with age-related changes involving the shape of the mandible. Breeders should avoid breeding animals that exhibit these inheritable malocclusions. When dental problems with your horse arise, always consult an equine dentist or a veterinarian with special training in equine dentistry. Without good dental health, your horse's performance and well-being are severely affected. Peak performance and harmony between horse and rider go hand in hand with regular dental care and attention to any developing problems before they become serious enough to affect the horse's health or compromise its well-being.